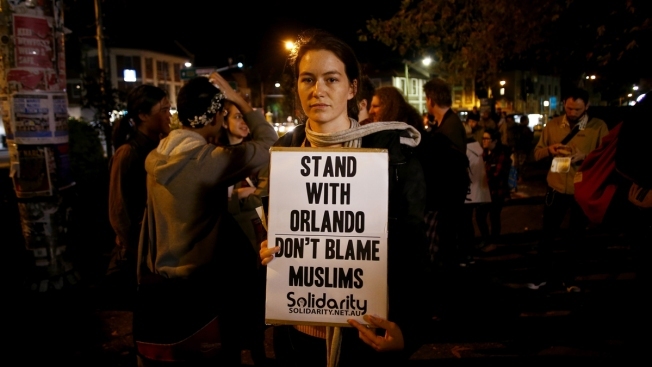 A woman holds a banner during a candlelight vigil for the victims of the Pulse Nightclub shooting in Orlando, Florida, at Newtown Neighbourhood Centre on June 13, 2016, in Sydney, Australia. New Hampshire communities are holding vigils for victims killed and wounded in the Orlando nightclub shooting over the weekend. In Concord, a group of about 20 people linked arms at the Statehouse to share prayers for the 50 people killed and 53 injured in the shooting. A vigil and rally are scheduled for Thursday at the Keene Unitarian Universalist Church. At President Obama's request, Gov. Maggie Hassan ordered flags in New Hampshire be lowered to half-staff until Thursday.